The leading sales and channel enablement platform will now support electronic signatures. E-contract signing can make a lot of difference to the entire sales process by simplifying it to a large extent for everyone involved-salespeople, channel partners and customers. 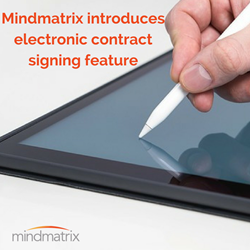 Mindmatrix Inc., announced the addition of an electronic contract signing feature to its channel and sales enablement software, permitting customers and channel partners to electronically sign contracts and agreements. With encryption and access codes in place, the feature meets the necessary security and legal requirements to ensure that any contract signed using the Mindmatrix platform’s e-contract module is secure and legally binding. The e-contracts can be shared via email using the Mindmatrix platform. The contracts can be created using the Mindmatrix sales and channel enablement platform’s template creation capabilities. This allows for auto population of key sender and receiver data in the contract including company logos, names, contact information, company names, etc. The documents signed using the e-contract module are automatically stored in the Mindmatrix channel and sales enablement software platform and also reflected in the CRM that is integrated with the software. The e-contract signing feature is also supported in the app version of the sales and channel enablement software so that deals can be formalized anytime, anywhere.